Scattered across nearly every position group this year for the Ashland Grizzlies’ football team are question marks. Gone are the senior pair of linebackers who were the backbone of the defense. Gone is the running back who anchored the backfield. Gone even is the all state punter who consistently gave the Grizzlies big kicks along with being arguably the best receiver and cornerback on last year’s team. Following a run to the state championship game last year, this year’s season is likely dependent upon those question marks. Last year was a constant battle for now senior Tucker Atteberry. His back and forth quarterback battle with Kyle Weinberg was a story all last season. It ended when Atteberry injured himself in the semifinals against Wilson. He played safety in the championship game against Summit, but was unable to contribute on the offensive side of the ball even as the Weinberg-led offense stalled late in the loss. Now this year’s team is undoubtedly his team. In a team that is marked by the questions it faces, it is hard not to see Atteberry as the most steady part. 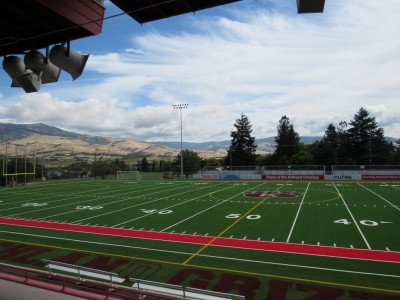 Like a large college facing a small school in the first week of the season, Klamath Union is unlikely to pose much of a challenge for the Grizzlies in their first game on their new turf field. Last year’s game ended with a score of 61-0 which might have been even higher had it not been for the stream of players without much game experience who were given time later in the game. That time to get experience is critical for the Grizzlies. A major player to watch will be sophomore Myles Montgomery. When injuries struck midway through last year, the then freshman earned a place in the starting line up. Without the services of graduated seniors Justin Robinson or Karter Cox, Montgomery will likely be playing a leading role in the defense even though he remains one of it’s youngest starters. Seniors Malik Pippa and Issac Hyatt both gained experience last year at running back behind Mason Dow. Pippa, the bigger of the two, is likely to take the bulk of the carries with Dow gone, but Hyatt is likely to play a key role as a smaller and quicker option. The Grizzlies will need to grow up fast. Following the game against Klamath Union, the Grizzlies head north to Bend for a rematch of last year’s state championship game against Summit. Ashland sits fourth in the Oregonlive 5A media poll. Summit is first.